What is the history of the finca, how did it start? Traveling around Latin America in 1981-82 Marga and Pieter fell in love with spacious Bolivia, her authentic culture and people. To stay and live in this new world was so tempting that they left Holland with ease. They bought this promising land and called it “La Víspera” (the Eve), which refers to a celebration of what is to come, a complete new life, full of expectation. Marga comes from a family where beauty, music, writing, design, painting, gardening, good food, theatre, colours and fabrics were a major focus. She is known as a clear-headed lady, she is a gardener and perceiver. Pieter is a descendant from a family of hermits, pub owners and grocers, and loves building, waterworks, horses, dogs and trees. He is a charismatic and tireless active man. In Holland they both worked in education for 10 years. It was in that period that Pieter, who has played the piano from an early age, took up a 3 year evening course to become a professional piano tuner. The first 8 years here their revenue came from 4 months-per-year tuning and restoring pianos in whole Bolivia. During that period both came to know this country more profoundly. The rest of their time they ‘invented’ the finca, by listening to the tunes of their fantasies and asking each other: “Is the playground feeling still there?” This land offered them plenty of space and inspiration to develop all their hidden talents and thus create their own paradise. Everything feels in balance, and all the details! How did they do it? Organically, step by step, daily good-attention, by combining passion for gardening with the curves in the soil, using the materials available in the region and good administration. Doing what the Bolivians do: developing different sources of income. By welcoming the surprising talents of all those people who worked on the finca in the course of time. By learning to see setbacks and disappointments as challenges. By being both generous & practical in answer to the needs of guests. The Finca is a playground, sanctuary, home and working place. This old and vibrant land where traditional farming formed the landscape. 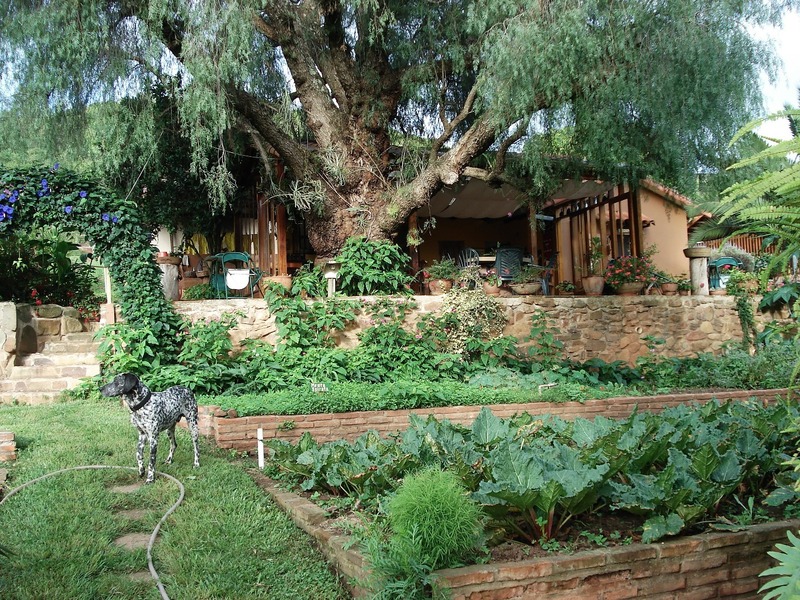 We introduced modern biological horticulture, and developed a fusion of both, nowadays known as permaculture. After all this years the Finca has become one of the most important places to get organic fruit and vegetables, edible flowers, natural medicinal mixtures, delicious teas, seasoning herbs and home-made conserves. Our fresh products are for sale in Hipermaxi supermarkets. We deliver edible flowers, herbs and vegetables to restaurants & tearooms on a daily basis. In the Herbolario herbs are dried and processed into delicious blends on a daily basis. We also process herbal extracts, massage oils and make our own mango & cherry tomato chutneys, jams, rhubarb sauce & fruity nectar, leafy vegetables & edible flowers. All our products are part of the slow food menu at the Café Jardín. Slow Food made right when you order with all organic ingredients straight from our terraces. And a lot of love. All beautifully finished houses are mostly built with natural local materials. We have been playing with circular forms, the Golden Ratio Φ and Feng Shui. 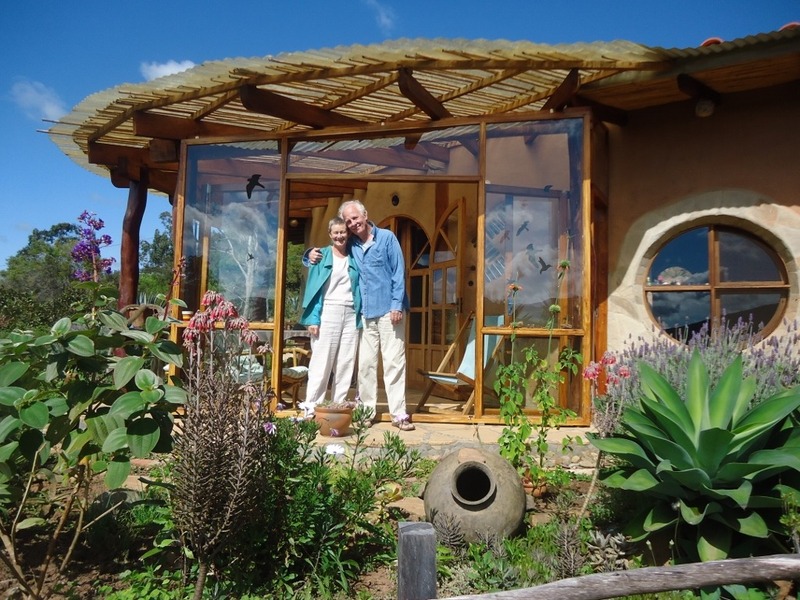 In the rounded houses we applied adobe, glassware and earthbags (superadobe), using various technics and art forms. The finca is home to some 90 species of birds; you can find iguanas, foxes, hedgehogs, squirrels, skunks, weasels, guinea pigs, bats, and sometimes even see an Andean deer, a porcupine or a mountain cat. Samaipata Valley offers beauty where ever you look. After an easy walk uphill through the Native Park you’ll find the perfect spot to relax and meditate, enjoying a panoramic view.